March 30, 2018 in Peregrine Falcons Eastern Massachusetts, Peregrine Falcons Massachusetts, Peregrines at 250 Canal St. 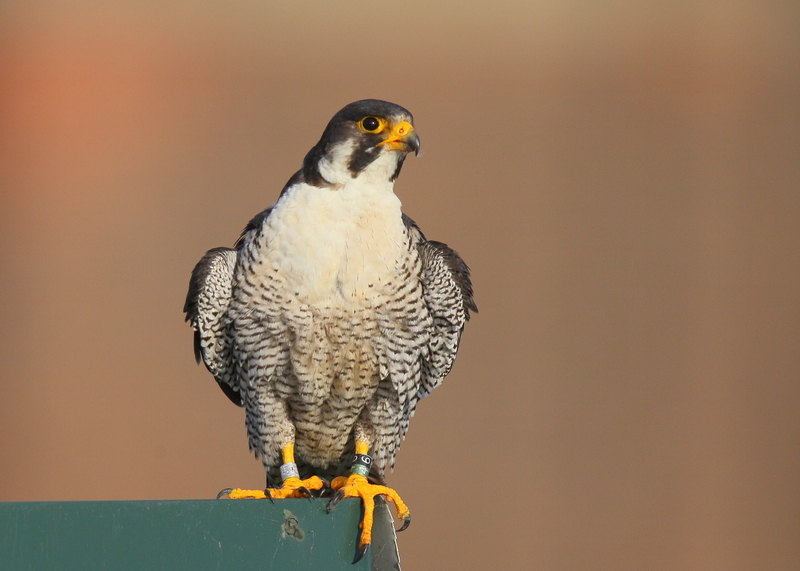 Many thanks to Robert Carlson for the stunning photos and report about the male Peregrine Falcon, Black 6/ Green 4. The altercation between the two males that was witnessed today, was a once in a lifetime opportunity to see Nature in action, and will surely not be easily forgotten! If anyone is interested, here is a little history that we would like to share about 6*/4*. Tom, you may recall that Dave and I have “known” this Peregrine since 2001, when we witnessed him and his other siblings fledge from the then “New Hampshire Building” in Manchester. He was the runt of the brood, and took a lot of time taking that first leap. In fact, we knick-named him “Crash”, as he seemed to have a tough time with his landings after fledging. He finally got it right, and he and his siblings liked to roost on the letters on top of the building. Of course, the building was later sold and the name was changed to the Brady Sullivan Tower. 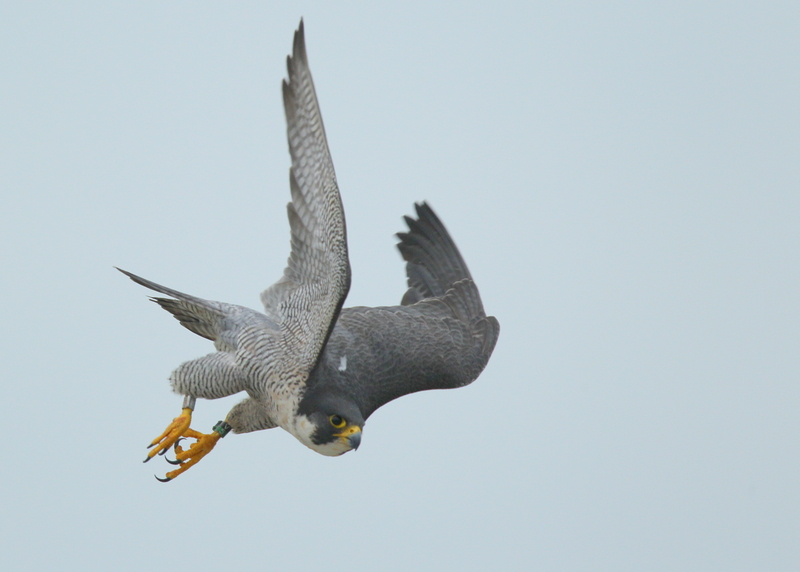 It was in 2002 that Joe Hogan first discovered a pair of Peregrines in Lawrence, and followed their activities that eventually led to their nesting in that city, beginning in 2003. We subsequently confirmed the male’s band, as you mentioned in your note, and have been monitoring him ever since then. We named his mate “Victoria”, as her bands were Black V/ Green 5, and they dominated the territory until her death in 2015, at the age of 14. By our calculations, the pair raised 32 chicks over the 12 years they reigned. She was replaced by the presumably current unbanded female. Even though Crash was grounded by the new aggressive male, he did manage to fly off, and it is our hope that he is still alive, and can protect his dominion. But as you said, time will tell who will prevail. Chris Martin of New Hampshire Audubon, who banded Crash in 2001, once wrote an article about this runt and named it, “Don’t Count the Little Guy Out”. Chris depicted this Peregrine as the least likely to survive his siblings, but wrote that this was not the case. It turned out that 6/4 out lived all three of his siblings. At the ripe age of 17, please don’t count the “little old guy” out! Again, thanks to Robert Carlson for reporting the incident, and to Tom for passing on this very important information. 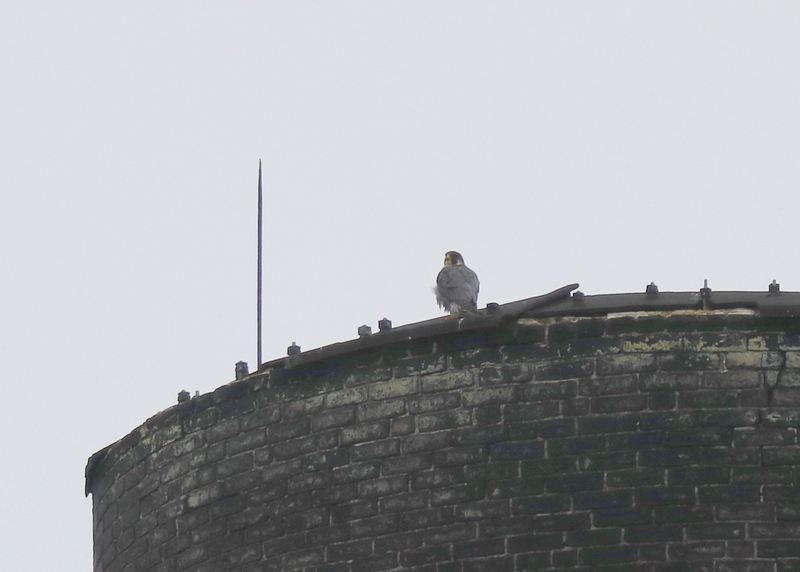 Lawrence Peregrines: female atop smokestack! March 20, 2017 in Peregrines at 250 Canal St. 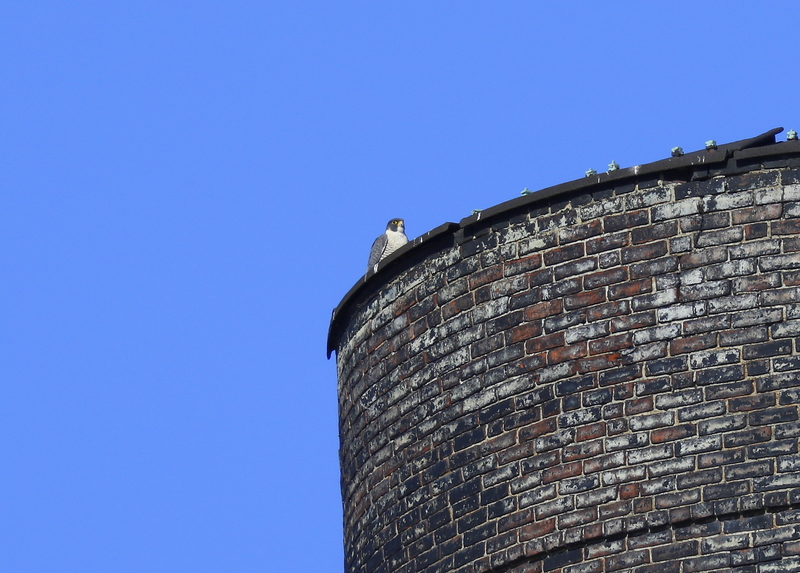 While scanning for falcons in the area, just happened to glimpse a perched bird atop one of the old brick towering smokestacks in the 250 Canal Street building complex. This a perch that gets much more use after fledglings have left the nest box. Once in a while the adults perch here as well….here the female enjoys a spectacular view of the river and surrounding area! September 29, 2016 in Peregrines at 250 Canal St. 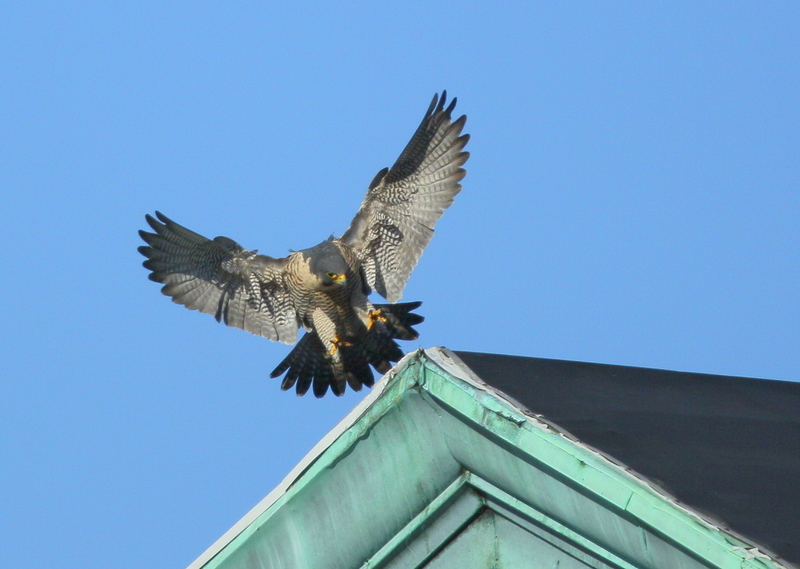 Stopped by the Clock Tower for a morning look at the Lawrence Peregrines. One was perched on a ledge just above the west facing clock face. Scanned to see if the other peregrine was nearby. Noticed a hawk-like silhouette atop the distance smokestack almost a 1/4 of a mile away on the north side of the Merrimack River in the 250 Canal Street complex! Sure enough, turned out to be the other peregrine falcon! Lawrence Peregrines: fledglings flapping away! June 15, 2016 in Peregrines at 250 Canal St.
After fledging the young peregrine falcons continue to work at strengthening their flight muscles. They are frequently seen near the natal site flapping their wings and preparing for increasingly longer flights around the local area. This young fledgling was seen with two other siblings on the corner of a rooftop of an abandoned building in the late day sun! Notice the leg bands, black over green, 85/BS. Lawrence Peregrines: 250 Canal St.
January 28, 2016 in Peregrines at 250 Canal St. 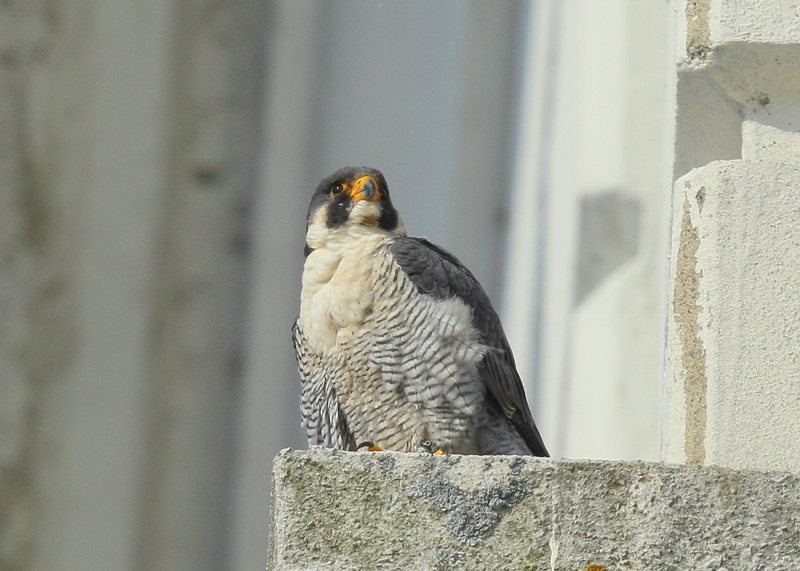 The Peregrines continue to be seen daily around the extended Clock Tower building and nearby. They tend to stay in fairly close proximity to one another. 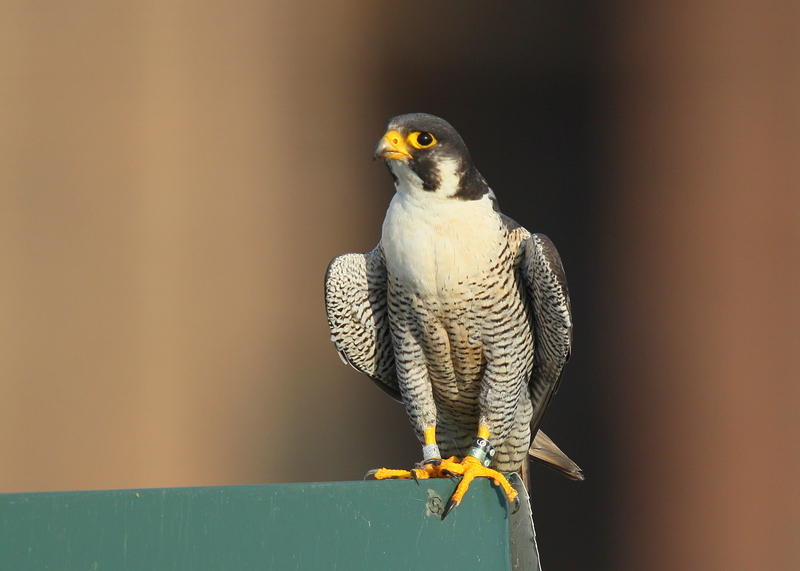 This morning, the female was on lower, east facing ledge with some prey in its grip. 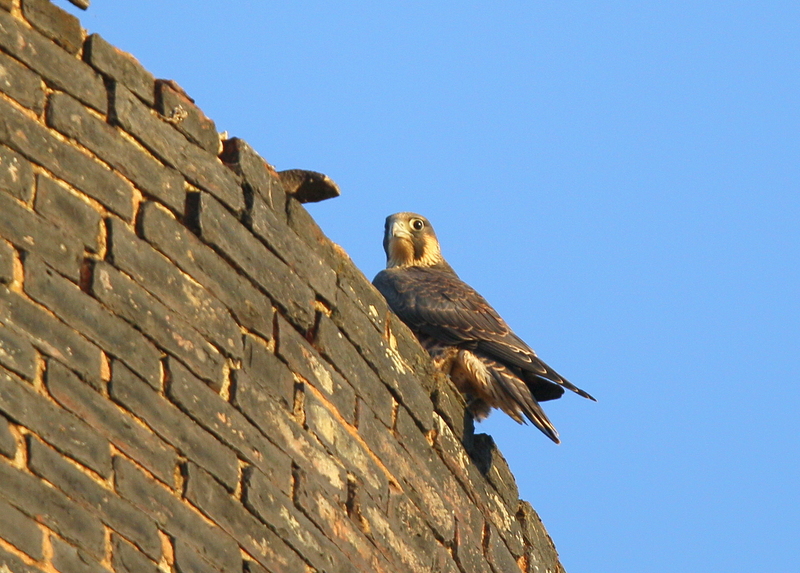 the male was nearby atop one of the triangular rooftop pediments. What fun to watch them both move around a few times! This photo shows the unbounded female making a graceful landing with wings fully outstretched! 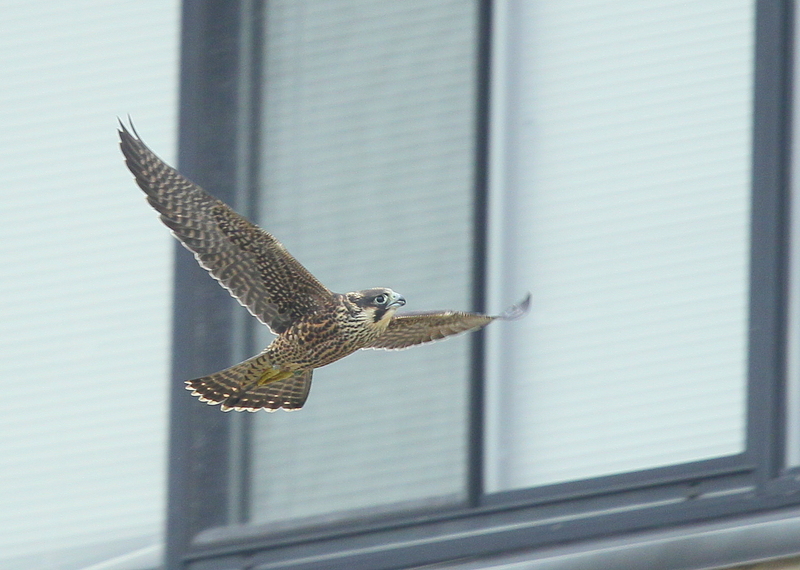 June 17, 2014 in Peregrines at 250 Canal St. 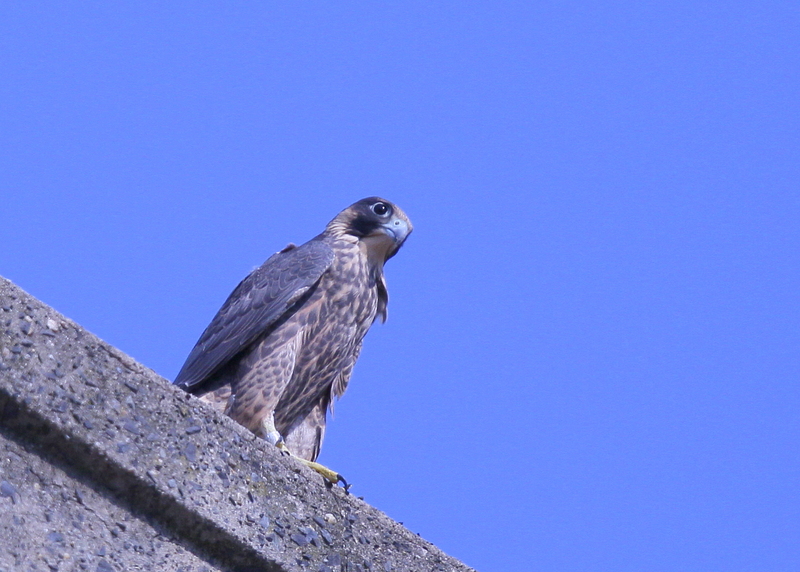 The peregrine fledglings have been seen on many of the local warehouse building rooftops. This late afternoon sighting was at the 250 Canal St. warehouse complex on one of the west facing roofs. The young falcon was solo looking west! June 19, 2013 in Peregrines at 250 Canal St. The Peregrine chicks continue to be seen all around the area rooftops, sometimes perching and sometimes tsaking off on a new flight patterns! This chick was twisting and turning around a very tall smokestack and then landed on top and enjoyed the view!